This ship log goes back in time, with newest entries at the top.We cover the Save the Delta Queen Campaign, general steamboat news and history, steamboatancestry, paddlewheel boats wantedor for sale, and model boats.More Save the Delta Queen Campaign web sites:steamboats.org *save-the-delta-queen.org *DQ bumper stickers, pinsTo search this section or the whole site, go to Steamboat News Archive.If you want to post to this page, click here. message: Working on a children's book about river ports and looking forinformation on African American steamboat pilots and captains. Have seen onereference to a boat being built in Cincinnati in the 1850s that was to havea black captain - nothing more. Does anyone have any info? Thank you. Editor's Note: Sounds like a great project, keep us posted on what you find! Correction - regarding that one reference to an African American captain, it was published in the Cleveland Gazette, March 14, 1885. A group of "colored" citizens of Cincinnati had organized to build a steamboat to run between Cincinnati and Memphis. Stockholders were from Covington, Louisville, Lexington, Charleston, Jeffersonville, New Albany, and Madison. She was to be eighty feet long, built by John Mack, "according to the most recent statement." The crew was to be all black, and "Cooper has been spoken of for captain, with Matt Mitchell for mate and Wm. T. Peyton, of Louisville, for head clerk." To be spoken of for captain I assume Cooper had a license. I found this piece (see attached) under "The African American Experience in Ohio, 1850-1920," on the Ohio Historical Society website. Our book is in the proposal stage - we'll see if we can sell it. It is intended to be a well-researched 64-page picture book (illustrated) history of an imaginary but "typical" river port from Native American village to today. Editor replies: Thanks for the information, and may I post the jpg you sent? message: My parents had a wedding reception on a boat called the ss edgewater. They were marriedbetween 1945 and 1955 in St. Louis Missouri. Their names were Fred and Virginia Schoemehl. I'mdoing some family research and I was just wondering if someone on this site might be able to help me. Editor's note: The Way's Packet Directory has no mention of a boat by this name, does anybody elsehave information to share with this researcher? Editor's Note: The boat does not look anything like the Delta Queen, but it is an interestingnovelty item. To see all Dave Thomson exhibits at Steamboats.com, click here. message: My Great Great grandfather was Alex Wagnon and my grandmother tellsme he used to pilot the Altamaha up and down the Savannah river when shewas a little girl. I am trying to find a picture of the boat. NEW at Steamboats.com: A remembrance of Captain Mary Greene called, "My Mother Reprimands a Ghost,"reprinted with the permission of the author - read it here. Acting on behalf of the Town Council, Newburgh Town Manager Cynthia Burger wrote letters this week to area congressmen in an effort to get the Delta Queen back on the Ohio River. The four-deck craft was taken off the water last year when Congress refused to grant an exemption from federal law that bans overnight passengers on boats that are made largely of wood. 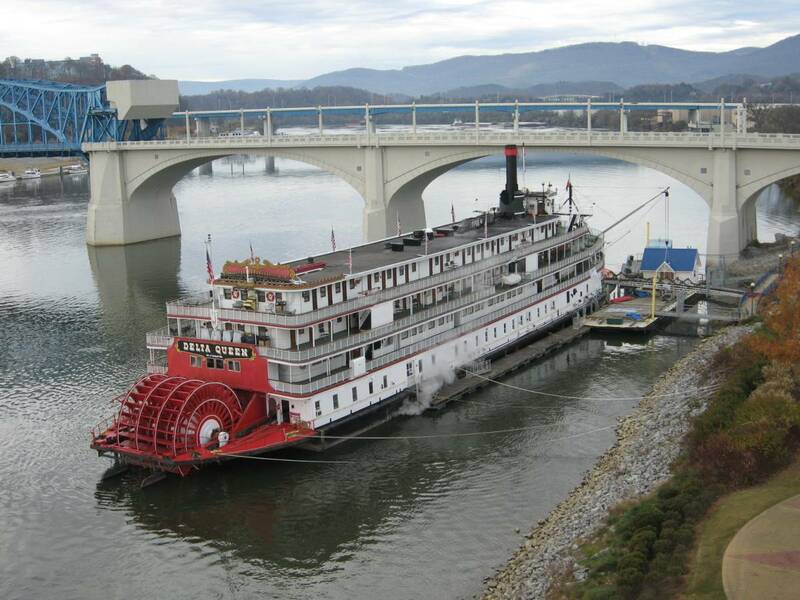 The 83-year-old sternwheeler was designated a National Historic Landmark in 1989. 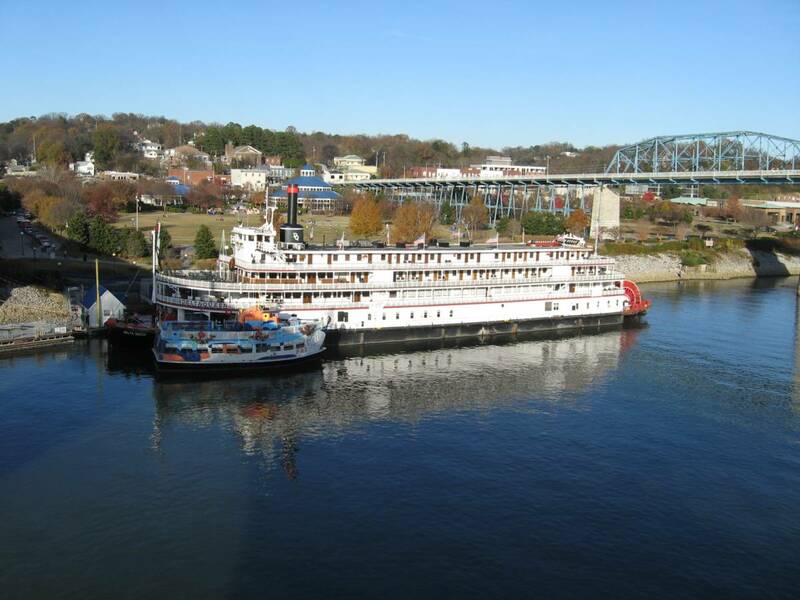 It is currently docked in Chattanooga, Tenn. In the letter, Burger pointed out that in 2008 the town of Newburgh presented 1,250 signatures on a petition to extend the exemption. "This issue is still of utmost importance to citizens of communities along the Ohio River," Burger said in the letter. "Any legislative assistance in this matter would be greatly appreciated." Editor's Note: Please write to your federal legislators (two Senators and your local Representative)and ask them to grant the exemption to the Delta Queen so she can return to service. A man had just arrived on the Delta Queen & the porter carried his bags up to his room. As heset the suitcase in the room the porter asked him if his wife was traveling with him on the trip. "No, not this trip" he says, "I'll have the room to myself." "That's terrible!" said the porter. "Who in their right mind would pass up a trip on the Delta Queen,especially with the beautiful weather we are having for the Fall Foliage this year!" "Well, actually, she was supposed to make the trip, but she passed away. This will be the firsttrip we haven't been to together since we got married in 1967." "Oh ... I'm sorry to hear that. That's terrible. But couldn't you find someone else, a friend or a relative,or even a neighbor to share the room with you?" The man shakes his head. "No they're all at the funeral!" 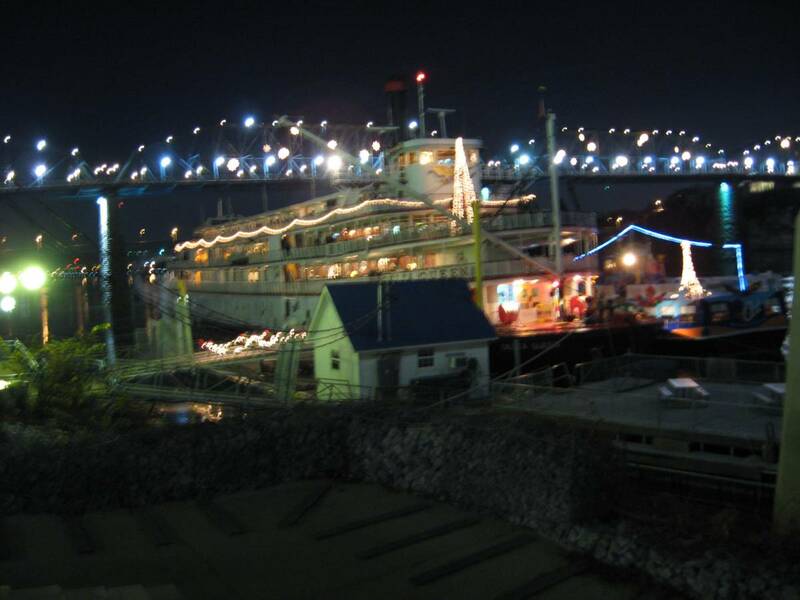 New exhibit at Steamboats.com: Let'sRemember the Mississippi Queen, including photos donated by Karen "Toots" Maloy. Editor's note: Everybody watched the show. The ghost busters were quite harsh withour beloved ghost, Mary B. Greene. They taunted her by pouring a glass of whisky andby telling her the boat would never run again. Instead of Mary, they found the ghostof Edgar Marshall, a pilot who died about twenty years ago. That was kind of creepy, butthey interviewed Mike Williams, who knew Edgar Marshall, and he said that he for one wouldaspire to ending up as ghosts on the Delta Queen. The boat probably has hundreds of spirits hanging around. 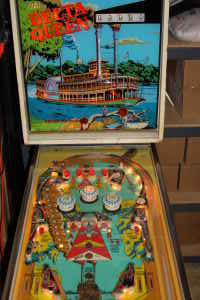 New exhibit at Steamboats.com: steamboat jewelry - click here. Steamboats.com would like to thank John Weise, longtime correspondent and reporter atlarge, for sending these recent photos of our Queen.Please take time out during the the busy holiday season to remember our boats and thepeople who love them. 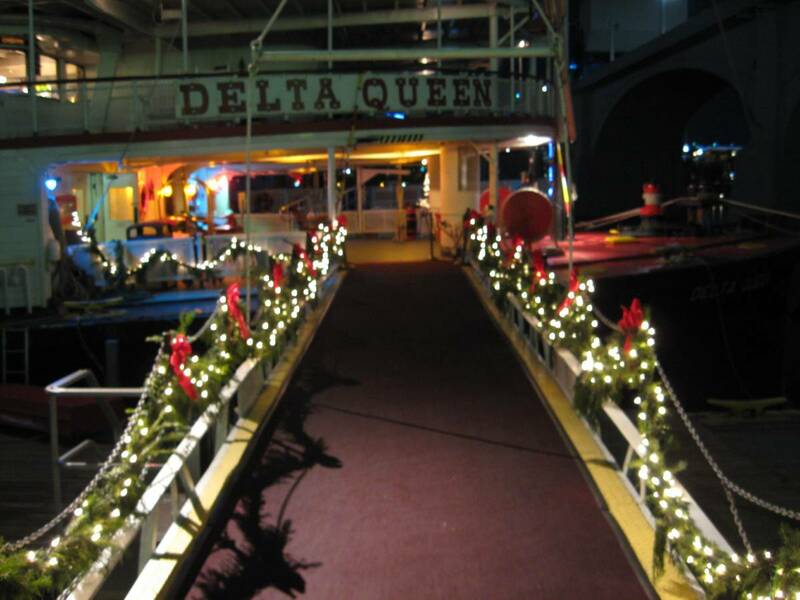 Steamboat Calendars, Holiday Cards, and Gift Items:Delta Queen Commemorative Plaques *Delta Queen holiday cards *Delta Queen coin *Delta Queen calendar *Steamboat preservation calendar.